This month I chose to feature the Stamp of the Month with the new Victory paper to create some masculine cards. I had fun creating cards combining the You Are... stamp and the Victory paper (X7150). My first card is 6x6 and I used a sketch from Wishes. Although the pattern was for a 4 1/2 x 4 1/2 card, I altered the size a little to make it bigger. I needed a bigger opening for the stamp I wanted to use in the center. The center is slit and corners are folded back to expose the back side of the paper. This paper was just perfect for this technique. I made it look like I fastened the corners down with the small wooden buttons from the Wooden Designer Buttons (Z1387). Here is a little close up view. I used one of the new Tough Tags (Z1692) in the corner of my card. 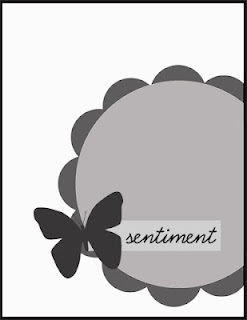 My next card is also adapted from a sketch in the How To Book - Wishes. This is a 3 1/2 x 8 card. I used the criss-cross stamp to create a background on Bamboo cardstock. I stamped a little starburst image across 2 strips to create a border for my "AMAZING" piece. Foam tape was applied to the edges of the center to pop it up from the border. Next, I covered my dimensional element star (Z1680) with the plaid pattern paper from Victory. (Of course - I used the Art Philosophy Cricut Cartridge to cut it out first!). I used the Natural Hemp to wrap around my star and added an Olive Button under "You Are Truly". The button and button brads are from the Mini Medley Accents Olive Collection (Z1489). My last card was simple and easy..... It's 4 1/4 x 5 1/2. I used a inked one of the Dimensional Element Tags with Chocolate ink and then covered the bottom portion with stamped background bamboo cardstock. I added another tag from the Tough Tags (love these!). The strip of stars across the card is one of the zip strips from the pattern paper. (LOVE how these can be used!) My little bit of ribbon is from the Designer Ribbon Blue Collection (Z1385). I hope you enjoyed my cards! Be sure to let me know which one is your favorite! Now hop on over to Kristine Ponte's blog and see what she has created! Here is another card with the Dotty For You paper! I thought this 5x7 card was perfect for this week's Clean and Simple Challenge sketch. I finally managed to squeak in some crafting time before our game this morning. I got my new "Dotty For You" paper on Thursday and couldn't wait to start playing with it. I had planned to spend Saturday evening and today in my craft room but that didn't happen. Weather and games had other plans. My daughter's game was rained out yesterday so we had to go back today and play. I had about an hour to play to this morning so I wanted to give the Sweet Sunday Sketch a try. I love this paper! 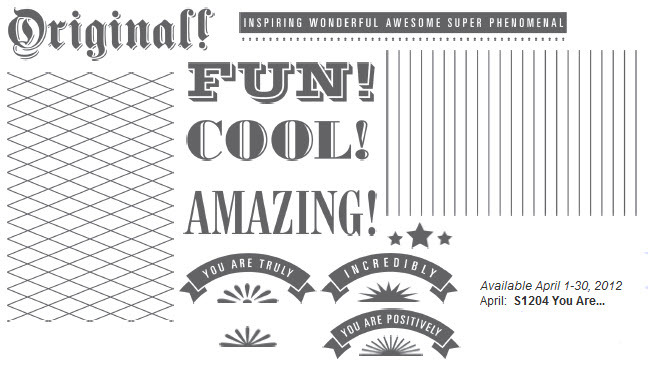 The Dotty For You paper is a specially designed paper pack for National Scrapbooking Month that is coming up on May. Stay tuned for more creations with the Dotty For You paper! I've got more posts coming! 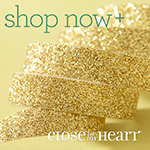 New Close To My Heart Websites! I guess I outdid myself at the retreat a few weekends ago. I haven't felt very creative since I've been back. My scrap table is growing cold without me there. I had good intentions of doing a few things last night but after dinner I went for a walk. I'm going to try to get back into my daily walking routine. Sometimes it is hard when I've been gone working all day. By the time I get home I usually have a list of things I need to do and walking hasn't been on that list. I'm going to make that a priority now. After I got back from walking, my daughter was leaving to run over to The Avenue to pick up a pair of shoes she's been wanting. Her friends were all busy so she was going alone. She is on spring break this week and I thought it would be fun for a little Mother/Daughter time. I think she was happy for me to come along. So, there went another night leaving my scrap table all alone. I thought this would be a good time to talk about our new Close To My Heart websites. They are FREE to all consultants which is really cool! 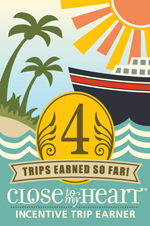 (Another perk to being a consultant!) So anyone, at any time can shop on our sites! I love it! Here is screen shot of the main page: The main picture changes every few seconds - showing are special for the month or other great artwork. Ready to SHOP? Just click on the SHOP link and you are ready to begin! If you haven't ever shopped on-line before, you can set up an account. Each time you go back to shop - your information will be there PLUS you'll be able to see what you ordered on-line before! PRODUCTS- This link will take you to our On-line Idea Book and Studio J Online Scrapbooking. The Innovative Products section will tell you about all the innovative products that Close To My Heart has produced. Want to know more about the Art Philosophy Cricut Collection? Click on the link and find some Tips & Tricks, A Shape Index and more! OPPORTUNITIES - Interested in being a Hostess? Or maybe you are thinking about being a Consultant (you'll get one of these cool websites!). The Opportunities link will provide the information you need to get started. There is also a link that will share about our favorite charity - Operation Smile. ABOUT ME - this is where you can find out a little more about ME! IDEAS & INSPIRATION - This is a link you'll want to visit often! Under Project Inspiration, Close To My Heart will post videos on how to use some of our great products. You will truly be inspired. Also, included in the Ideas & Inspiration heading is our Workshops On The Go! This is where you will find additional Layout and Bonus projects that go with the Workshop On The Go kit you purchased. PROMOTIONS - And the best link of all? Promotions of course! Here is where you'll see our montly specials. 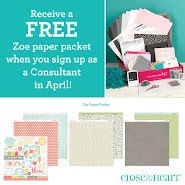 (This month's special - join my team as a Close To My Heart Consultant and you will get the Art Philosophy Cricut Cartridge for FREE!) Be sure to go check it out. 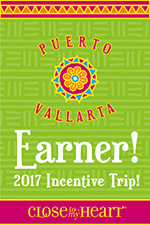 Also, under Promotions is our Stamp of the Month. Each month's exclusive stamp has feature artwork and you can find instructions for creating this artwork here! Now that we've navigated some of the links, lets discuss the bottom portion of my website! Each month, Close To My Heart will feature a product. This month is our cute little Sweet Surprises Card Kit. There is a video about this kit under Ideas & Inspiration! Next, you'll see our Stamp of the Month. This is a special stamp that can ONLY be purchased during the current month. You can get it at a low cost of just $5 when you spend $50. (Retail value is $17.95). That's a deal! On the right side of the page are my Open parties. 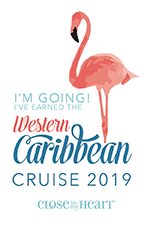 If you'd like to add your order to one of the parties so that the hostess will get credit, just click on the "JOIN" link. You don't have to JOIN a party to shop! You can always shop on your own by clicking on SHOP. If you want to host a on-line gathering - let me know! I'll get you set up and you can direct your friends to my website to JOIN your party! It's that EASY! And the very bottom, are more links to additional information about Close To My Heart. But more important, my links are there! 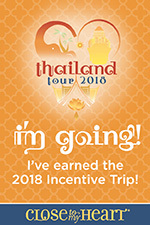 You will see my email address, a link to my StampinHeaven Facebook page, a link to my StampinHeaven blog and also my Pinterest. Something very important to note: Our new websites no longer have a calendar. I've added one here on my blog. You will need to come to my blog to check out my calendar. Also, our websites no longer have an artwork page but that is what I use my blog for! So you'll want to visit my blog for artwork ideas by me! I hope you enjoyed my little website tutorial. Now, go check it out! Click on the "Shop with Me" box in the top right margin and it will take you there. Be sure to stop by the Ideas and Inspiration link! Let me know what you like about the new websites! It's been a week now since I've returned from Petticoat Junction. A group of us try to get down there at least twice a year - once in winter/spring and once again in the fall. We always have such a blast. This time the winter weather stayed away and the drive there was absolutely gorgeous! It was hard to stay on my side of the road because I just wanted to gaze at the beauty of the landscape. Petticoat Junction sits in the little town of Normandy, Tennessee which is about 20 miles off I-24 heading towards Chattanooga. Once I got off the boring interstate, my drive became winding country roads through a landscape of rolling hills with white fences and green fields. The Bradford Pear trees were in full bloom, and the sky that met the hilltops was the most beautiful blue with fluffy white clouds here and there. You really feel God's beauty on quiet drives like these. Once I got to the retreat and unloaded, I was on a mission to get several things done. Many of my To Do's were to get ahead on some projects - upcoming Stamp of the Month artwork, Workshops on the Go and more. But I also brought along some personal things I wanted to scrapbook. I rarely get time to scrapbook for myself anymore. Even though I use my pictures for my Workshop pages, still, I rarely sit down and just do whatever I want! I wanted to share a few layouts I made. The first 2 layouts I used my VERY FAVORITE paper - Stella (X7147B). I found pictures from our family reunion we had last September right before I left for the retreat and realized that they would be perfect for this paper! I used the Stella Canvas Shapes (X7147C) on this layout and added some of the Bohemian Assortment (Z1687). Here is another layout - This is one of my 'go to' sketches that I love to use. I used words from the zip strip to compliment my right page layout. They were perfect for my theme. Next, I had pictures from my daughter's sorority formal I wanted to scrapbook. I used the Florentine paper (X7153B) for this layout. I still want to add more embellishing but haven't had a chance to sit down and finish it yet. But I wanted to share it anyway. I love the sparkle flourish on the left page. This is the from the Sparkle Flourishes set (Z1708). I also used the Timeless Charms (Z1689) along with another Bohemian Assortment! 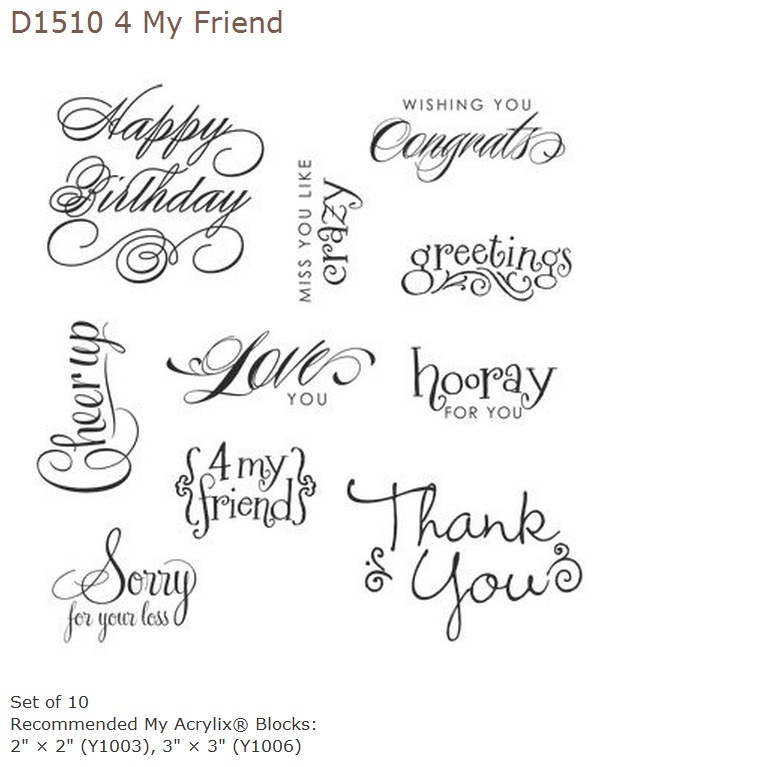 "beautiful" was stamped with the new Keepsake E-size alphabet (E1024). I love how you can stamp the letters into one flowing word. Again, I used the zip strips. This time I used them as a border for my 'beautiful' title. I have 2 more layouts to share but will hold those off to share those a little later. But that is all for now. I haven't created one single thing since I've been home - life got REALLY BUSY. But hopefully I'll make it back to my scraproom soon. If you live anywhere near Tennessee - check out Petticoat Junction. It is a fun place for a scrapping good time with friends! Ah! My dear friend Krista Hershberger awarded me the Liebster Blog Award! I met Krista a couple of years ago when we both won the Close To My Heart Spa Trip back in 2010. We've stayed in touch ever since and meet up each at convention. I love checking in with her blog. She always has something amazing to share! Be sure to check it out. It's Krista's Crafty Corner! So what Is this Liebster Blog Award? This award is for bloggers with less than 200 followers, to bring attention to their blog, and increase their following! Here are some of the blogs I subscribe to. I love to check up on them weekly (Sometimes daily!) to see what awesome creations they are sharing. I'm sharing this award with them! Please stop by to visit them, and become a Follower. Here is another card I make while at my scrapbooking retreat this past weekend. 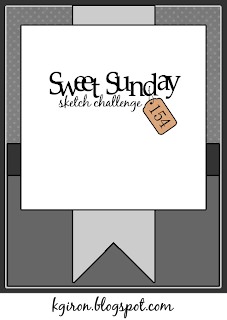 I used the Sweet Sunday Sketch for this 4 1/4" x 5 1/2" card. Hello! I'm back from my weekend retreat at Petticoat Junction! What a great weekend! There is nothing like spending the weekend with a bunch of gals that love creating and scrapbooking. We laughed a lot and ate WAY to much! I was able to get some projects completed for some upcoming workshops plus I've made my cards for the next 2 upcoming Stamps of the Month! It feels good to be ahead of the game! I'll be sharing those as the time comes. This morning before I had to pack up, I was able to made a couple of cards for some challenges. 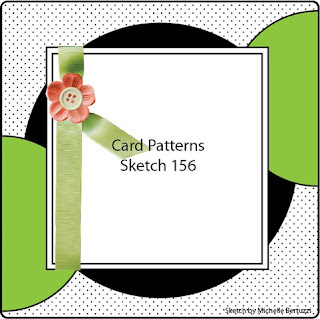 I used the Card Patterns sketch for this 6x6 card. Art Philosophy Cricut Cartridge - 5" and 3 1/4" <Circle2> 3 1/4"
I needed to create a sympathy card this past week so I used the sketch from the Clean & Simple Challenge blog to make this card. I used Bamboo cardstock and paper from the Pemberley Workshop on the Go Kit (G1033) for this card. This kit comes with a coordinating stamp set. I used the flower stamp to create my flower by stamping it several times and then cutting it a bit smaller each time. The light shade of the flower is stamped using the 2nd generation technique. I added Pearl Adhesive Gems for my flower center. The ribbon is from Mini Medley Accents - Honey Collection (Z1488). The sentiment is from 4 My Friend (D1510) stamp set. 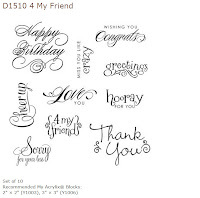 This set has 10 sentiments perfect for any occasion. I used the Art Philosophy Cricut Cartridge to cut the shape for my sentiment. Hope you enjoyed my card! I'm packing up to head out to Normandy, Tennessee - Petticoat Junction. Will be spending the weekend will 11 fun ladies for a weekend of scrapbooking, and fun times creating! Hopefully I'll have lots to post when I get back! A Baby Card with Springs! 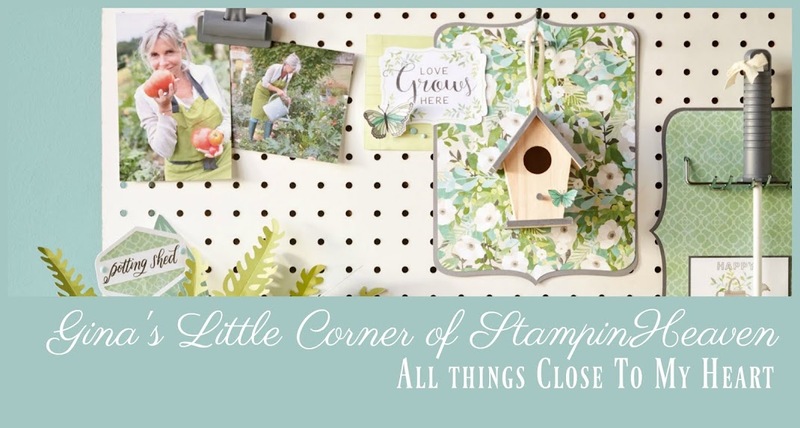 Close To My Heart has a cute little New Arrival (C1501) stamp set in the new Spring Summer Idea Book. I don't have too baby type stamps and whenever I need to make a card for a baby shower, I never seemed to have one I really liked. When the new Idea Book came out I quickly added this one to my collection. CAS-ual Friday's challenge this week is "make a clean and simple baby project". I had the perfect opportunity to try it out! I used the sketch from Freshly Made Sketches for my 4 1/4 x 5 1/2 card. I used the Cotton Candy B&T paper from the Lucy (X7149B) paper pack for my card. The base in the center is random stamped with the little flower from the New Arrival stamp using Cotton Candy ink. If the center looks a little off, it is my elephant is 'springing' to greet you! I used one of Close to My Heart's new products - Adhesive Springs (Z1725). These little 3/4" springs will make your artwork 'pop'! You get six springs in the package for only $2.95. To complete my flower, I wound Cotton Candy pom pom ribbon to add a soft center to the paper flower. Next, I added a Pearl Adhesive Gem (Z1336). The pom pom ribbon is from the Designer Ribbon Pink Collection (Z1384). Want to see even more creative ideas for these fun Adhesive Springs? Watch this quick video for some fun things you can create! Have you noticed I changed my blog header? I made this mini banner with one of Close To My Heart's new My Creation products. The My Creations Mini Banner (Z1736) has 10 white chipboard pennants in four different shapes. They measure 3" x 4". Perfect size to create something fairly quickly. I used the Stella Paper Pack (X7147B) to cover the chipboard pieces. This was AFTER I created 2 layouts, and six cards! 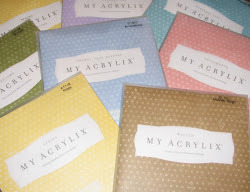 Just shows how much you get out Close To My Heart's paper packs for only $9.95! - And I still have paper left! I had so much fun putting this together. I sponged Lagoon, Cocoa and Sunset ink on the different letters of the Dimensional Element Monograms for the word "create". Creating this banner was even easier using the Art Philosophy Cricut Cartridge (Z1686). I just selected the shape on the cartridge and cut the my paper to fit the size of the banners! No trimming necessary! Got to love that! I used many of Close To My Heart's new embellishments featured in the Spring Summer Idea Book. See the little wooden flower, dragonfly and butterfly? These are from the new Color Ready Accents - Garden Wooden Shapes (Z1718) You can color them but I think they are just as pretty left 'naked' which is what I did here. 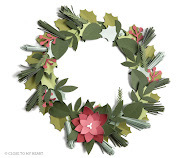 Another new product I used was the Paradise Paper Flowers (Z1710). I used the Sunset flowers here but the package also includes Creme' Brulee, Lagoon, Smoothie and Sunset in 4 different styles. Oh! I used a daisy Lagoon flower underneath a wooden flower (right). I tied a little bit of Baker's Twine onto the letters and on the Wooden Buttons (Z1387). The Baker's Twine comes in 2 color assortments - Paradise Assortment (Z1702): Creme Brulee, Lagoon, Smoothie and Sunset; and Neutral Assortment (Z1701) - Black, Chocolate, Grey Wool and White Daisy. For my finishing touches, I added a few sparkles to the flowers, butterfly and dragonfly. I hope you enjoyed my banner as much I had fun creating it! I shipped this banner off to Close to My Heart as part of my application to teach at this year's convention. Once I get it back, I'll be hanging this up in my craft room! This week at 4 Crafty Chicks they are looking for anything but cards! 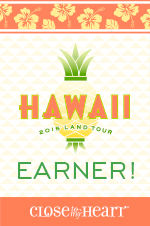 So I'm sharing on their challenge blog!